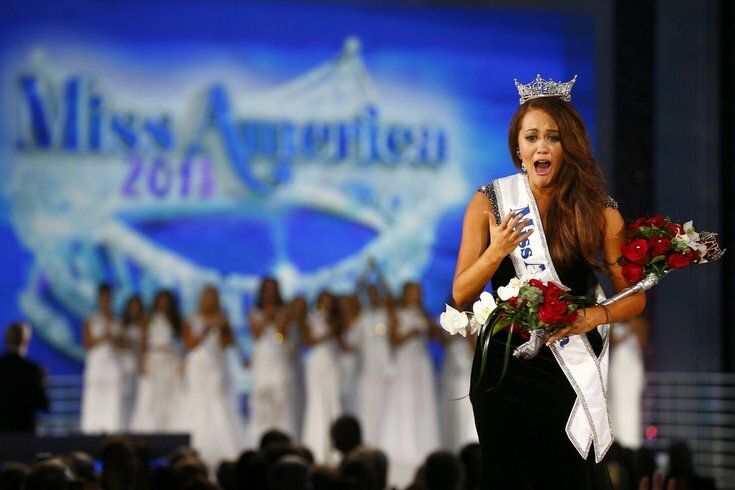 Miss America 2018 Cara Mund, from North Dakota, reacts after she is crowned at Boardwalk Hall in Atlantic City. The Miss America Organization announced Tuesday that contestants will no longer compete in a swimsuit competition, nor will judges base the women on their looks. Gretchen Carlson, the 1989 Miss America winner who will soon be chair of the Board of Trustees for the organization, announced the changes on "Good Morning America" Tuesday, saying, "We are no longer a pageant. We are a competition." Instead of the swimsuit competition, the women will take part in an interactive session with the judges to discuss their passion about the job of being Miss America. "It's going to be what comes out of their mouth that we're interested in, when they talk about their social impact initiatives," Carlson said. She also emphasized that the competition needs to communicate a major purpose for the event, which is to award scholarships. "We've heard from a lot of young women who say, 'We'd love to be a part of your program but we don't want to be out there in high heels and a swimsuit.' So, guess what, you don't have to do that anymore," Carlson said. Another aesthetic-focused aspect of the competition, the evening gown segment, is also getting a change. The women will be asked to wear something that makes them feel confident and reflects their personal style, under the premise that they will not be judged by their outward appearance. Since being crowned Miss America almost 29 years ago, Carlson has become an outspoken advocate in the #MeToo movement, previously settling a lawsuit against former Fox News Chairman and CEO Roger Ailes in 2016. Carlson sued her former employer for sexual harassment. Late last year, Sam Haskill, the former CEO at the Miss America Organization, resigned after internal emails leaked, revealing messages between Haskill and other employees insulting the appearance and lives of former pageant winners, including Carlson. He resigned two days after the emails leaked. Carlson is now part of an all-female leadership team at the organization. Miss America originated as a swimsuit-specific pageant in Atlantic City nearly 100 years ago, in 1921. The first competition, on the Atlantic City boardwalk, had contestants from only a handful of nearby states and the District of Columbia. Throughout its history, the contest has been protested by various groups, criticized for its depiction of women and its lack of diversity -- the first African-American woman to compete, Cheryl Browne, was not included in the pageant until 1970. "This is a new beginning, and change can sometimes be difficult," Carlson said. "I never thought I would be chairwoman of the Miss America Organization, but here I am, and we're moving it forward and we're evolving in this cultural revolution." The changes will begin during the 2019 Miss America Competition, which airs live on Sept. 9, 2018 in Atlantic City.